Advantages: Book: Interesting story of an overlooked aspect of P-51 history; 19 colour profiles; decal tie-in (available separately); plenty of helpfully captioned photos; covers history, operations, camouflage and markings; full text and captions in both Dutch and English. 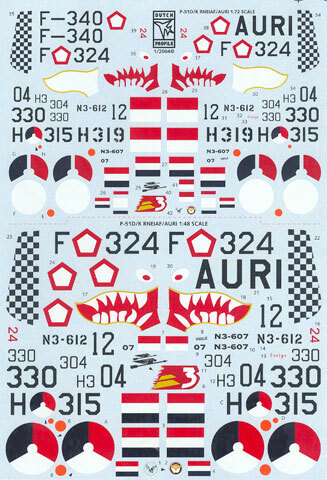 Decals: High quality decals with minimum carrier film; includes both 1/72 and 1/48 scale decals; comprehensive instructions; some very different Mustang markings! The second release in the DutchProfile series is "P-51D/K Mustang History, Camouflage and Markings, Royal Netherlands East Indies Air Force". This book covers the Mustang's role in the Dutch return to the Netherlands East Indies, and also touches on the transformation of some of these machines in the new Indonesian Air Force. The 40 pages provides concise yet informative coverage of the period made up of historical text presented in both Dutch and English, lots of great reference photos, seventeen attractive colour profiles, tables, drawings and four-view marking diagrams. A number of the featured aircraft are adorned with "shark mouths", including two of the wildest Mustang schemes I have ever seen. These are on Indonesian AURI aircraft (ex-Dutch) - one in natural metal with a black and white chequered tail and a lively 3 Squadron logo; and the other in Olive Drab and Aluminium with a wide section of the nose painted red. In addition to the colour profiles, the book includes photos of both these remarkable Mustangs. The photos and profiles in the book display some of the interesting attributes and armament of these Dutch and Indonesian Mustangs, including tail-warning radar, dummy rockets and bombs, odd hook-shaped aerials and even customised camera pods adapted from 75 gallon drop tanks! Mustang fans will find plenty to keep them entertained between the covers of this new book. I saw the back page of the book first. The wild, shark mouth Indonesian P-51s immediately caught my eye. Wouldn't it be great if there were decals for these birds, I thought. I flicked back a few pages and saw a brochure advertising - you guessed it - decals! Even better, they included markings for the natural metal shark mouth Mustang. I flicked through another few pages and - be still my beating heart - the decals themselves were nestled between the pages of my review book! The decals are available separately, or may be purchased as part of a package deal. The sheet includes markings in both 1/72 and 1/48 scales, although there are a few more 1/72 scale options than 1/48. 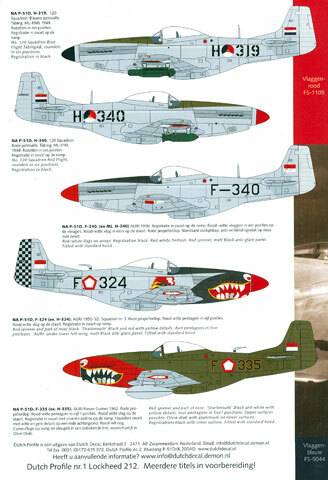 Subjects are P-51D and Ks, with a combination of standard and Dallas canopies, in Dutch and Indonesian markings. The decals are produced to the same high standard as Dutch Decals earlier releases, with thin carrier film and generally good registration, although the red of the Dutch roundels was slightly misaligned on my sample. Instructions are very good, with text descriptions in Dutch and English, and four view diagrams as appropriate. I really do like the recent trend of specific subject reference books tying up with a simultaneous decal release. This "one-stop shop" style of reference and markings is very useful to modellers, especially in niche subject areas such as this. 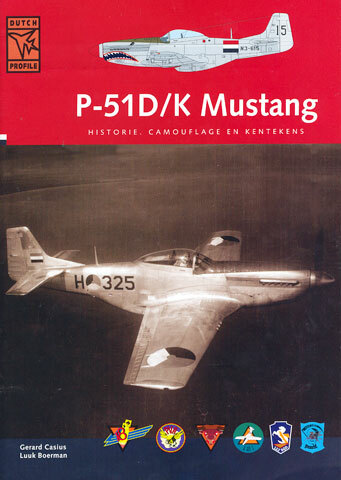 DutchProfile's "P-51D/K Mustang History, Camouflage and Markings, Royal Netherlands East Indies Air Force" is an interesting account of an almost forgotten corner of aviation, and will be welcomed by Mustang fans and history buffs alike. The decals are the icing on the cake for modellers of 1/48 or 1/72 scale kits. Thanks to Luuk from Dutch Decals for the review samples.